" We are most satisfied with the house plan with pent roof while the house feels pretty damn solid"
A house with 1.5 plan with pent roof. It was the family Gubics criteria when they sat down at the computer and started looking for house constructors. After a bit of searching online they found a house with a floor plan that suited them. 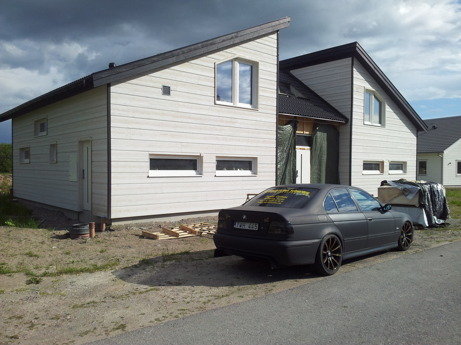 They had found the Villa Discovery among the product range of Bosum Building System. 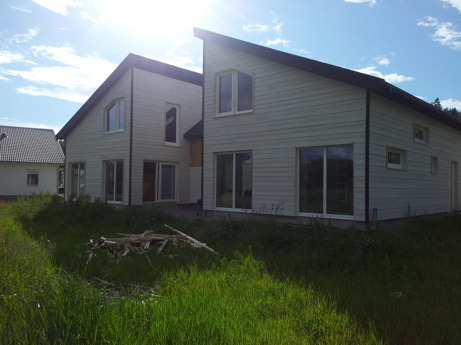 During the summer of 2014 the family's house construction started. Down below the family shares their thoughts and experiences about the project. - When we sat down and started looking for house constructors, we already knew that we wanted a villa with 1.5 floors with pent roof. 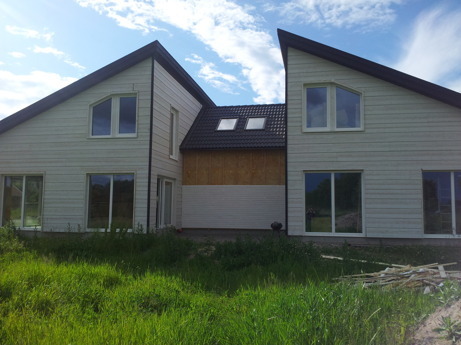 After some searching we found that the company Bosum Building Systems had a house model with exactly the plan we were looking for. At this time we had no thought about building in massive wood, because it was mainly the floorplan we got stuck in. We contacted the company and discussed a proposal where we made some changes on the house after our wishes. - The construction went on very smoothly and it seemed easy for the consultants to put together the house. The products were delivered on time. 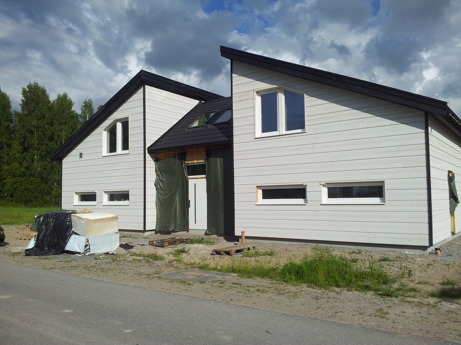 - Today it remains a little work around plumbing and facade to get the house ready, but it's ongoing bit by bit. We are most satisfied with the house plan with pent roof while the house feels pretty damn solid. If your standing inside the house and your partner calls out your name from the second floor, tou can bearly hear it. We would definitely recommend a kit from Bosum Building System to others and have actually already done it!